In the earlier part we had seen how thoNdaradippodi AzhwAr enjoyed the whole thirumEni (pachchai mA malai pOl mEni) of emperumAn and certain divine parts of his thirumEni such as “pavaLa vAi” and “kamala chengaN”. He then called him as “achchuthA” to denote that he is unchanging. We shall continue from there. amararERE – this refers to those who constantly enjoy the above-mentioned beauty of emperumAn (“amarar” here refers to nithyasUris – those who dwell in SrIvaikuNtam always). Even though they constantly keep having dharSan (audience) of bhagavAn, they have not seen the end of that experience – i.e. they have not got full satisfaction of having ‘seen’ him fully. If they are able to have this experience of enjoying him, viz. experiencing him fully, they may not exist anymore. Hence they are called as “amarars” – those without an experiential end. emperumAn is their Lord (ERu – master or Lord). Both rig vEdha and sAma vEdha say “sadhA paSyanthi sUraya:” (the nithyasUris see [experience] him always). ennum – emperumAn asked AzhwAr whether he derived sweetness by looking at his thirumEni (physical form) and thinking of his auspicious qualities. AzhwAr replied that this was not the reason for deriving sweetness; it was by merely pronouncing his divine names that he got the sweetness. The word “ennum” should be added to each of the qualities mentioned earlier such as “pachchai mA malai pOl mEni ennum”, “pavaLa vAi ennum”, “kamalachchengaN ennum”, “achchuthA ennum”, “amararERE ennum” , “Ayar tham kozhundhE ennum” to get the full meaning of the qualities described. It is by saying each of these that AzhwAr derived the sweet taste that he is going to speak of, next. ichchuvai thavira – leaving aside this elixir. chuvai – elixir. Instead of enjoying this elixir (of reciting his divine names) is there any point in looking for some other taste? AzhwAr tells emperumAn that he has to elucidate about the divine names of emperumAn only because emperumAn has never pronounced them himself [He has only heard them from his followers and not pronounced them himself and hence does not know how sweet they are]. yAn – I, who has a tongue suited to reciting your divine names. Another meaning – I, who does not have the patience to wait for a delay in going to SrIvaikuNtam. pOi – to go. Instead of enjoying here, at SrIrangam, itself or any dhivyadhEsam close to SrIrangam, you are asking me to go to some place which is so far away, tells AzhwAr. 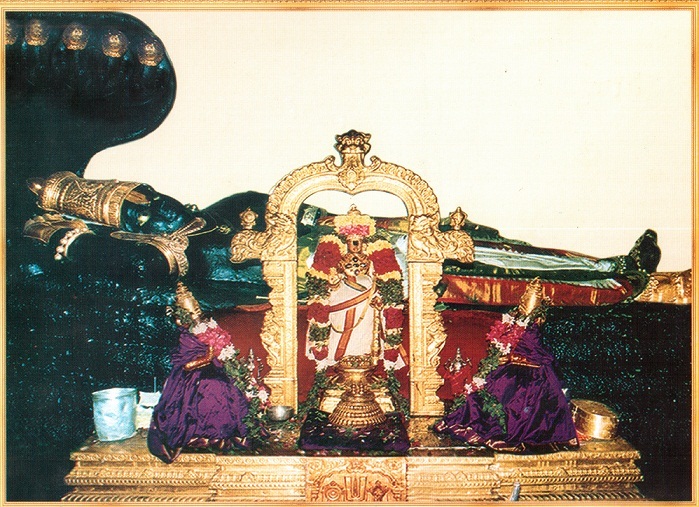 indhiralOgam – SrIvaikuNtam. The land of one with unlimited wealth. Here the word “indhira” does not refer to the head of swargam, but to emperumAn. Moreover any word that we pronounce ultimately points to SrIman nArAyaNan only, as per vEdhas and hence “indhira” refers to emperumAn only. ALum – rule. AzhwAr is being invited by emperumAn to do as he pleases at SrIvaikuNtam. He can be the king there. But even then…..
achchuvai – ichchuvai – achchuvai (SrIvaikuNtam) refers to something which is to be learnt through vEdhas only whereas ichchuvai (reciting emperumAn’s divine names) refers to something which is evidently clear to AzhwAr. That has to be heard from someone else whereas this is right in one’s hands. peRinum vENdEn – even if I get, I will not take it. emperumAn tells Azhwar “now you would say that you don’t want it, because you have not got it. But if you were to get it, you would change your mind”, to which AzhwAr responds, “ why don’t you give it to me? Then you will realise whether I desire it or not”. This is why AzhwAr says “even if I get it” (peRinum). If someone says that milk is sour or it is bitter, one can argue with that person. But if the person says that he does not want milk, there is nothing that can be done. AzhwAr says in the same way that he does not want indhira lOgam (SrIvaikuNtam). Is there anyone who said that he does not want SrIvaikuNtam, asks the vyAkhyAthA, and gives the answer himself that hanuman had refused it when offered by SrI rAma (….bhAvO nAnyathra gachchathi) […my thought will not be with SrIvaikuNtanAthan]. emperumAn asks him, “you are saying that you do not want paramapadham (SrIvaikuNtam). What is the good thing that you have here? In summary, even paramapadha anubhavam (the enjoyment in SrIvaikuNtam) is not equivalent to enjoying your divine names here. Your divine names are that sweet. This entry was posted in mudhalAyiram, thirumAlai on August 2, 2016 by T N Krishnan.